Homemade puff pastry is such a treat. Lots of flaky layers of buttery crisp pastry. Unfortunately it seems to be something that people are a little hesitant to make at home. I want to change that by offering you this recipe for Blitz Puff Pastry or Quick Puff Pastry, a puff pastry that is easier to make then the classic (traditional) puff pastry. Yes, the first time you make homemade puff pastry it can seem a little complicated, with all that rolling and folding and chilling. Technique is important but it's not hard to master. And while it does take about three hours start to finish, most of that is not hands-on work, it is letting the dough chill in the refrigerator. Blitz Puff Pastry is perfect for making galettes, tarts, turnovers, cheese straws, and even Napoleons. It uses the same basic ingredients as the classic puff pastry, that is, butter, flour, and water (no leavening agent is added). The difference is how they are put together. 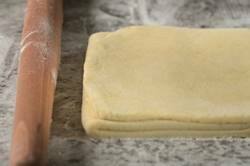 With the classic puff pastry you have a sheet of dough which you wrap around a block of butter (like a croissant dough). Conversely, with the Blitz Puff Pastry you incorporate the butter right into the flour, like you would when you make a pie dough. But with both types of puff you do roll and fold the dough several times (called lamination). Then, during baking, the "puff" happens when the butter melts and creates steam, which pushes the dough upwards, giving you all those wonderful flaky layers. A few things to keep in mind when making puff pastry. First, time is needed to make this dough. For Blitz Puff Pastry the dough needs to be rolled and folded four to five times, and you need to chill the dough between each roll and fold. Now, if you notice the pastry getting too warm when rolling, stop and return the dough to the refrigerator until firm. Because if it gets too warm, it will cause the butter to melt into the dough which will affect the texture of the finished product. Also, if you find your dough is getting too soft or overly sticky when rolling, again stop and chill the dough until it becomes firm. And if you find the dough is springing back (shrinking) when rolling, again return the dough to the refrigerator and let it chill, which will relax the gluten and make it easier to roll. Lamination: Transfer to a lightly floured surface, sprinkle the top of the dough lightly with flour. With a floured rolling pin roll the dough vertically until the length is three times the width (about 18 x 6 inches (45 x 15 cm)). Apply even pressure when rolling the dough and lift the dough frequently as you roll so the dough doesn't stick to your counter. Flour as necessary. Roll end to end, not side to side, making sure the dough is of even thickness. When it's at the correct length and width, fold the dough lengthwise into thirds, like you're folding a letter. Make sure the edges of the dough are straight and even. You now have your first turn. Gently wrap the dough in plastic wrap and refrigerate until firm (about 30 to 60 minutes). Second Turn: Place the chilled dough on a lightly floured surface so the folded edge is on your left (like the binding of a book). Repeat the process of rolling your dough to 18 x 6 inches (45 x 15 cm) and fold the dough again into thirds. This is now your second turn. Gently wrap the dough in plastic wrap and refrigerate until firm (about 30 - 60 minutes). Third and Fourth Turn: Take the chilled dough and repeat the rolling and folding into thirds, two more times. Chill the dough about 30 to 60 minutes between turns. This is your third and fourth turn. After the fourth turn check the dough. If there are visible streaks of butter then you will need to do a fifth turn. The dough is properly laminated when there are no visible streaks of butter and the dough is nice and smooth. At this point the puff pastry needs to be chilled several hours before using. Well wrapped, the puff pastry can be stored in the refrigerator for up to 3 days or frozen for about 3 months. Defrost the pastry in the refrigerator overnight. Makes 1 1/2 pounds (670 grams) of puff pastry.